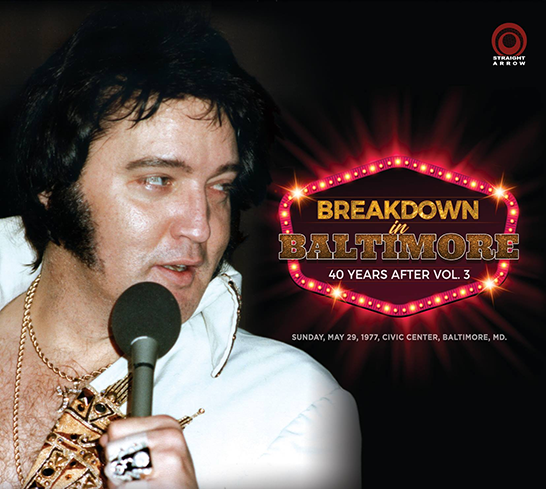 “Breakdown In Baltimore – 40 Years after Vol. 3” è il titolo del nuovo doppio cd che la Straight Arrow ha in programma, con il concerto del 29 maggio 1977 al Civic Center di Baltimore. La registrazione proviene da una fan di Washington e la qualità audio è molto buona. In passato questo concerto è stato pubblicato due volte: nel 1994 dalla Groti Records con il titolo “Send Me The Light I Need It Bad” e nel 2011 dalla Memory Records con il titolo “Baltimore Nightfall”. 01. Introduction: Also Sprach Zarathustra – 02. C. C. Rider – 03. I Got A Woman / Amen – 04. That’s All Right – 05. Are You Lonesome Tonight – 06. Blue Christmas – 07. Heartbreak Hotel – 08. Love Me – 09. Jailhouse Rock – 10. You Gave Me A Mountain – 11. Danny Boy (Sherrill Nielsen) – 12. Walk With Me (Sherrill Nielsen) – 13. 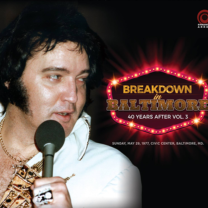 (Let Me Be Your) Teddy Bear / Don’t Be Cruel / Elvis leaves the stage – 14. Walk That Lonesome Road (J. D. Sumner & The Stamps) – 15. My Heavenly Father Watches Over Me (Kathy Westmoreland). 01. Introductions of singers, musicians, orchestra (by Charlie Hodge) – 02. Early Mornin’ Rain (sung by John Wilkinson) – 03. What’d I Say (James Burton, instrumental) – 04. Johnny B. Goode (James Burton, instrumental) – 05. Drum Solo (Ronnie Tutt) – 06. Bass Solo (Blues – Jerry Scheff) – 07. Piano Solo (Tony Brown) – 08. Electric Piano & Clavinet Solo (Bobby Ogdin) – 09. School Day / Elvis returns – 10. Hurt – 11. Hound Dog – 12. Help Me – 13. Unchained Melody – 14. Blue Suede Shoes – 15. The Wonder Of You (part only) – 16. One Night – 17. O Sole Mio (Sherrill Nielsen) / It’s Now Or Never – 18. Can’t Help Falling In Love – 19. Closing Vamp / Announcements.